Unlike the basic carded figure, this one has some minor deco changes which make it stand out as being unique enough to warrant a purchase. The head is the most obvious spot-- he's got a very pronounced scar over his right eye. If this sort of thing bothers you, don't get it. I like the slight change as Anakin did indeed have some battle damage, and it's nice to see it highlighted a little. His armor seems a little darker, and the "wipe" over his shoulder armor is different than the basic carded release. Also, his projectile is a richer, darker blue color which looks a lot better. I like this figure more than the basic carded one, but it may not be different enough for you. Since the head is, to me, significantly different I'll consider this a different version of Anakin. So there you go. Buy as you see fit. But if you have multiple Anakins, don't use this one as a vehicle pilot unless you want it to look screwed up after you remove it from the vehicle in the future. Collector's Notes: This set is a strange one in that it behaves very differently from Hasbro's usual Target exclusives. It has shipped on and off since November 2008 to the present, and is still available without having been clearanced out. Upon its release, stores sold it for one of three unique retail prices, and today you might find it on varying levels of being slighty marked down. Expect to pay at least $50 for this boxed set, which isn't too shabby when you consider two exclusive vehicle repaints ($20-$26 each) combined with 6 action figures (comparable to the $8 retail products). Oh, and this figure doesn't have the exact same accessories as the basic one-- so you may wish to buy both. Commentary: Originally intended to be an Episode I figure, this Tusken Raider mold saw life as a Power of the Jedi figure and has been repainted a few times since. I like this mold a lot, it'd fit in with original trilogy Tuskens were it not for the missing, erm, canister around the neck. Still, it's great, and because A'Sharad Hett needs an army I'll buy every slightly different Tusken Raider that ever gets made by Hasbro. This version is neat because it works well as a repaint-- take an existing mold, change the color, and presto-- it's a new army builder. The figure itself is the same as the 2000 version in terms of articulation. That means the shoulders and neck move, one of the wrists moves, and you've got a single swivel elbow. At the time it was fantastic, and it still looks pretty great, especially as part of a Tusken "crowd." The leg movement may as well not exist due to the robes blocking the legs, but hey, maybe you're good at tweaking these things and can repurpose them to gain leg movement. 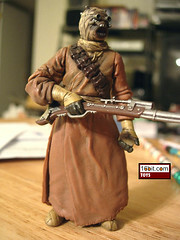 If you like Tuskens, you'll be happy you picked up a "red clan" Bantha with Tusken Raiders battle pack. If not, well, it's pretty expensive for what you actually got in the set by 2007 standards, although by today's standards it might be considered a mildly acceptable deal. Collector's Notes: This mold was originally released in 2000 as a Power of the Jedi carded figure. In 2002, it was repackaged with a Massiff and sold on a blue Saga card. Come 2004, an Original Trilogy Collection version came out with a pretty awesome paint job looking a little bit like the promotional shots from the first film. 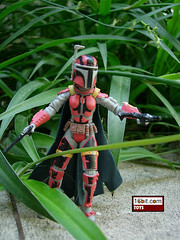 In 2007, Hasbro released it again in "tan" and "red" clan variants in the Bantha battle pack. This is, of course, the red one. Commentary: Everything old is old again. This Stormtrooper is pretty nifty for a variety of reasons. 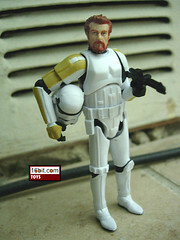 First, it's Hasbro's first attempt at an Endor-specific Stormtrooper. 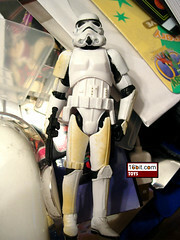 Second, it's a repaint... of the Sandtrooper from the Saga Legends and Saga Collection lines. You can tell because it has the hole in the belt and no grenade. The figure sports what can best be called "grass stains," or maybe "forest damage." It's essentially the same Vintage Stormtrooper we've been getting since 2004, but with the Sandtrooper's belt, oh-- and also the Sandtrooper's backpack hole. Can't forget that. Which basically means it's just a Sandtrooper minus the gear. As Battle Pack filler goes, it never gets better than this. Hasbro generally finds themselves forced to add value in a big boxed set, and sometimes what we get isn't fantastic. But Stormtroopers? That's exactly what you want them to throw in the box when there's room for more figures. Since this one looks a little different than every Stormtrooper figure ever released, collectors and troop builders will likely want to add it to their collection. You basically know what to expect from this figure, or you should, so enjoy it in all its white articulatedness. Collector's Notes: Multiple Stormtroopers and Sandtroopers have been produced on basically the exact same mold over the years. If you've been with us since 2004, you may have as many as 15 or even more figures with essentially this exact same body, and different deco, a unique head and a removable helmet, or some other tweak. If you don't have any of the figures based on this design, well, what the heck is wrong with you? Commentary: In the old days, Kenner didn't use shortcuts-- they spelled names out. That's why to my generation, a lot of fans will call this guy Imperial Stormtrooper (Hoth Battle Gear) rather than "Snowtrooper." I have no idea why one name was used over another, but I gotta say the shorter names like Snowtrooper and Sandtrooper have done wonders for the world of brevity online. This figure is particularly neat in that it combines aspects of the original figure as well as some benefits from the modern day, plus a newfangled notion of including a removable helmet. If you pop off the helmet/hood, you'll see a face of a Clone Trooper. This sort of thing upsets some fans as it supposedly means that all the troopers in the movie were spawned from the DNA of Jango Fett, which retroactively destroys your childhood perceptions of the figure. It's also possible that Hasbro just did this to do something different and it means nothing in the grand scheme of continuity. Either way, the face looks good, the expression is decent, and if you don't like it you can leave his hat on. He's super articulated, which means he has that full range of 14 points of movement. He can basically sit, he can stand, and he has a cloth skirt-- an improvement over the vinyl piece that always fell off or tore in the 1980s, and a huge improvement over the rock-solid, never-gonna-bend hard plastic skirts used in the 1990s and early 2000s. This is clearly the superior trooper, and for once Hasbro had the good sense to not sculpt on the command rank marking on his chest armor so you'll have an incentive to buy a lot of them. The one thing that really struck me as odd about this figure is his helmet. While the armor is as good as or better than all previous attempts, the helmet seems wider. I'm used to seeing a more elongated looking head, so this is a little off-putting. It's not enough to ruin the figure, though, and if you really can't stand it you can pick up the 2006 tin edition Snowtrooper and swap helmets. 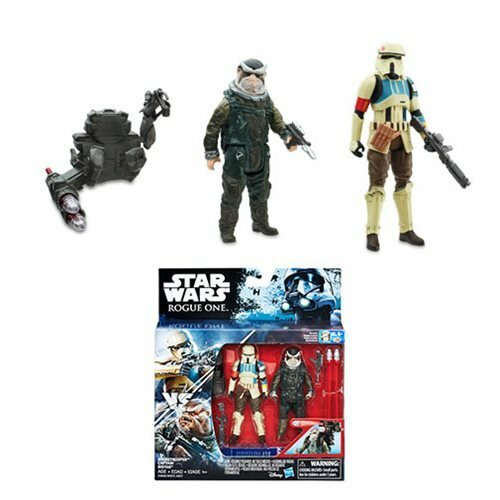 If you're looking to fill an AT-AT or crush some snow Rebels, this is your go-to figure. Don't expect it to get much better than this in the next five or so years. Collector's Notes: Hasbro isn't shy about reusing this mold. In 2007, it came out in the Spring. 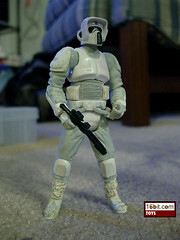 Come November, it was repainted for the exclusive Target Ultimate Battle of Hoth Battle Pack. 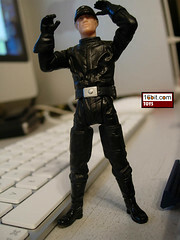 In early 2009, the figure was released as a basic carded Saga Legends figure with all his original gear plus a bonus weapons locker. So this new release is cheaper and has more stuff than the original. How great is that? This version is just as good as the Target repaints, I'd say buy both just for some variety. Commentary: We're a funny bunch as fans-- if we can name something, we'll basically demand a figure of it. Sometimes this leads to questionable sellers like Bail Organa here, a figure that came out within weeks of the first-ever super-articulated Star Wars action figure, yet has articulation that would have basically sucked in 1999. While the detail on his garments, jewelry, and arguably head are pretty great, he can't do much. Both wrists are articulated, as are both shoulders. His waist and neck can move, but his long robes make him a pepper shaker with arms. He's not going to do much other than stand there and look cool. Lucky for you, he looks plenty cool. His face sculpt looks a good deal like Jimmy Smitts, but unfortunately his skin is just a smidgen too pale to look right. The beard is basically right on the money, as is the hairstyle. There's certainly room for improvement, but he's a reasonably minor character with little action. It's rare that you have a character with lines that can't do anything but stand and nobody complains-- but that's what happened here. So enjoy kids, this is as good as it's going to get. 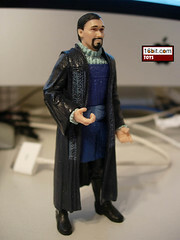 This is the only Attack of the Clones-specific Bail Organa figure in production. Collector's Notes: He sold better than many of his casemates, but he wound up on insta-clearance in many markets due to Hasbro renumbering the basic action figure SKU in early 2004. This caused the figure to become devalued pretty damn quick, meaning this won't cost you too much if you decide you want one now. He has never been reissued. ALso, despite the fact that the figure's hand was clearly sculpted to hold a gun, he does not include one. I started freaking out when I wrote this article because it looked like something was missing. Thankfully, it wasn't. Commentary: If you can't get enough of clones, you'll appreciate Hasbro doing yet another Clone Pilot. This time it doesn't seem to be based on any cartoon, comic, book, or other source but is rather inspired by the famous Space Whale design we've seen adapted to several other products. In other words, you'll probably want to get this one to sit in some ship of your choosing. The figure is essentially super-articulated with a removable helmet, except it features no waist joint. As it's based on a previous pilot mold, this is not surprising, but the issue of why there's no joint still has me curious. Why the heck not? It's not like there aren't multiple figures with spectacular midsection movement capabilities, so why not on this one? Ah well. 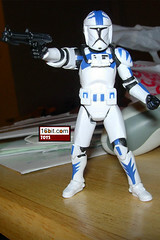 The white clone is augmented with blue stripes. "What you see is what you get" is such lame commentary but well, it's true! If you have this mold you know what to expect-- a solid figure that wants nothing more than to fly around in your vehicle collection. He's nicely articulated, but not perfect. As clone pilots go, he's about as good as AOTC-style pilots come, so you may as well get one or more for your navy. I like it enough, but truth be told it's living in a storage box where it has remained since purchase last year. It's really just more of the same, only different, so buy it if you're a fan of original designs, clones, or the whole Clone Wars thing. Collector's Notes: There were two previous pilots based on this mold. Technically they were pilots or troopers, depending on the helmet, but both were sold in the Evolutions assortment between 2005 and 2008. 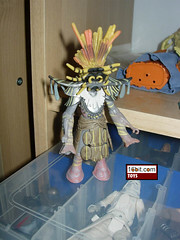 The same body was used to make the Poncho/Hawkbat Clone in 2007. You can still get it at retail. 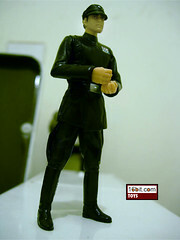 Commentary: Is this just a generic Imperial Officer or the recently named Lt. Renz, the dude who says "You Rebel Scum!"? Hasbro says it's "Imperial Officer," so I'm going to go with that. (Renz has gloves, too.) The figure is based on the Moff Jerjerrod body, but cast in black and with a new head. It doesn't look all that much like the Renz bust, so I'm more inclined to treat it like a generic Imperial Officer and say that this figure fits the bill for the update of the original 1980s Imperial Officer figure or is close enough for an update of a generic figure. (You may argue if you wish.) There's not a lot of new ground to break on a figure like this, but some elbow joints or articulation below the hips would have been nice. What we got is perfectly acceptable, as it has swivel shoulders, wrists, and elbows in addition to the standard six points of articulation. The deco is pretty basic, the figure is cast in black plastic and it's pretty hard to go wrong with "no paint." The boots are shiny, the buckle is painted, everything here is basically acceptable. The new head sculpt is nothing spectacular, his visor is really low so it's a little tough to make out his face. This could be pretty much anybody, were Hasbro to redecorate the figure or recolor the hair it could convincingly be yet another trooper. I like that. It's almost a shame that these aren't being sold individually as I'm sure army builders could stand to have many more for whatever it is that they do with them, such as populate that giant Death Star playset that we're never, ever going to get. But I digress. This figure is a great revision of a 2006 design and most importantly, it adds another Original Trilogy figure to your collection. A few, if you get the entire battle pack. Be sure you pick this up even if you think the Han Solo figure is worthless. Collector's Notes: This set originally was to include two black suited Imperial Officers, but the final product ended up with one as a cost-cutting measure. Boo, hiss. Still, this set is almost the most awesome Battle Pack which came out of Hasbro for the original trilogy as it includes three really good figures and a Han Solo that I really have no use for at this point. I'd gladly have shelled out $20something for the R2-D2 update, the Rebel, and the Imperial, so it's one of my favorite items from late last year. Commentary: For years, many fans (yours truly included) were asking when we might get a Hoth version of the Speederbike as seen in the Expanded Universe. 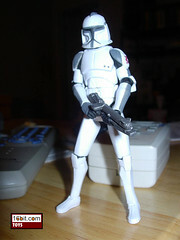 Well, we got one, with this Scout Trooper frankenfigure. Sometimes it was represented as a Snowtrooper, other times a Scout Trooper. Hasbro opted to smash together the vintage Scout Trooper and Snowtrooper action figures. The end result is a little awkward, but it's pretty neat. Sure, the arms are big and awkward, but you aren't going to get perfection when you shove one figure's arms on another's torso. What you get is adequate, but there's certainly room for improvement. The figure is super-articulated and painted well, but that isn't everything if the figure gets a little bit out of shape when he sits (check out his hips, those pouches get bent easily). As a boxed item, this figure is great. Sitting on the vehicle, it looks just fine. But if Hasbro ever put this figure on a basic card it'd look terrible. As such, get it with the vehicle if you get it at all, otherwise save your scratch. Collector's Notes: After numerous delays, the figure finally came out. And then it went away really fast. If you missed it, it might already be permanently removed from the plastic marketplace. Action Feature: Firing Missile Launchers! Commentary: There have been many ups and downs in the development of the Super Battle Droid. The first version in 2002 was nothing short of awesome-- subsequent releases have been all over the place in terms of deco, ability to stand, and accessories. This animated version is fairly solid, with a massive, exaggerated armored body and removable wrist rockets that don't get in the way of the figure's look if you leave them on or take them off. That's a win-win. While this figure has no knee joints, it does have ball shoulders and elbows, really awesome hands, an actual waist joint, and swivel hips. It's not a ton of joints, but these guys shouldn't really be super-poseable given they're essentially walking tank-bots. I love this figure's look, and he's sturdy enough to stand and can sit fairly easily. This is one of those rare figures that Hasbro managed to tweak to be a really good toy and an awesome collectible/denizen of your desk at work. If you don't like it's look, well, I understand-- it's very much stylized. But if you like the look and not the figure then you, sir, are a terrible human being. You need to get one or more of these. Collector's Notes: A version of this figure with slightly worse paint applications was included in the exclusive Target battle pack called "The Battle of Christophsis." 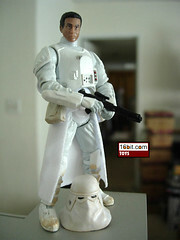 You really can't tell much of a difference, although the exclusive version is missing the firing wrist rocket launchers. They aren't a necessary accessory for full enjoyment of this toy, but the basic carded figure gives you the most stuff. Commentary: Hasbro's tooling for Rav Bralor was shared with Isabet Reau, meaning we got two female warriors with less work being done on Hasbro's part. (I'm all for this.) This red-armored figure was inspired by the strong back story of the Mandalorians, which has taken numerous forms from novels to whispers in comic books to art in magazines. It's also entirely possible this figure's face is based on a Hasbro employee, but who, I honestly don't know. The two figures share essentially the same body, but sport unique head sculpts, distinctive paint, and of course completely different accessories. While her helmet is a smidgen too big, the figure still looks pretty cool. Her red and black armor stands out from the pack of Boba Fett figures we've all bought over the years, and the cape is a nice change of pace over the traditional jet pack. With 14 points of articulation, this figure gives us way more than we're used to when it comes to exclusive sculpts. (For the record, these are usually about 6 joints.) While some fans have expressed a dislike for her lack of scars, I think it's OK. She does wear a helmet, after all, and her grey streak in her hair gives her a flair of distinction or serves as a reminder of great warriors who have since left us, such as E! 's John Henson. Despite having little to no real influence on the fiction at large, I like this figure and enjoy Hasbro's decision to start encouraging a few more figures with a little less history associated with them. I'd make some crack about her being better than another clone repaint, but she came with four of them, all black repaints at that. So we'll just move on and say I enjoy this figure a great deal, Mandalorian fans voted with their dollars, blah blah blah. Get one. Collector's Notes: This was an Entertainment Earth exclusive and did indeed sell out. As such, eBay may be your best bet. 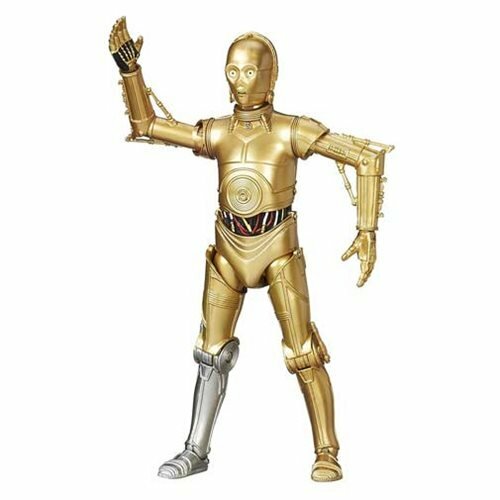 Commentary: Hasbro's Magnaguard droid action figures have been all over the map in terms of quality, and their names. Fans initially balked at the lack of a cloak on this new, animated-style figure mostly because of the fact that it meant that we would soon be subjected to the dreaded, inevitable double-dip. The good news is that this figure is so gosh darn likable that I don't care. Sure, it isn't perfect, but jeepers does it ever have a good personality. First, let's talk articulation. Hasbro managed to hide the wrist joints so they're pretty much invisible. The elbow articulation and shoulder joints are similarly disguised, and the clever waist joint is difficult for me to describe beyond... well, it's clever. The neck joint is a standard ball joint, and the hips are normal hips-- no knees, no ankles. The figure has big honking feet which essentially give this figure a tiny bit of that urban vinyl figure the kids all seem to love these days, and while I hate those kids, I do enjoy how they help this figure look like he has a bit more substance than the movie-based bodyguards. The deco is stunning. The multiple levels of silver and grey give this figure a used, dirty appearance with bright red eyes to give it life. If you open this figure and play with it, I can assure you that you will enjoy it. It's really fun to look at and to pose, and it may be the first separatist droid I've honestly felt I should have a small army of in ages. My only complaint today is the lack of leg articulation and the missing cloak, but those will no doubt come with a future rerelease. (I'm used to the abuse at this point.) If the figure fits in the canopy of the upcoming starfighter designed just for him, it'll be perfect in my eyes. I can't wait to give it a try! Oh, and the blaster makes him fall flat on his face. You should probably just throw that in a box and ignore it. Collector's Notes: This is a new figure, and one I really dig. I could take or leave a lot of figures, but this is one I can't ignore. Love it. Want lots. Avoiding some of the issues of scene-accuracy is this sandstorm version, which comes from a deleted scene. Because of this, Hasbro gets to dodge some issues of documentation in favor of a figure which looks about right. This figure builds on that 2007 version (with its 14 points of articulation) and makes some important improvements. For example, the hands don't look quite as freakish, and Luke has his black glove on his right hand. The figure isn't nearly as freakishly tan, and the face looks a bit more like Mark Hamill and slightly less like an angry, shaved blonde ape. 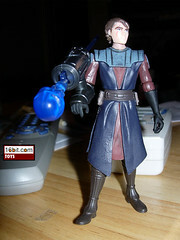 The costume is lacking the "vest" seen on other Jedi Knight Luke figures, which is inconsistent with the photos from the set. Still, it looks good, which I guess counts. I like this figure because it's different, has unique accessories, and pretty great articulation. He can sit, and he can stand. He doesn't fall apart easily. Oh, and you can pose him in multiple fairly awesome ways. Hasbro could do better, and they very well might later this year when another new Jedi Luke comes out, but this one is fairly decent. I'm not sorry I got this one because I'm a sucker for deleted scenes, accurate or no. Hasbro's various recent Luke figures are all over the map in how their faces turned out, and this is one of the better ones. (It ain't perfect, but I dig it.) If you own one or more skiffs you should probably get one 'cuz it's cool. I'll stop writing now. Collector's Notes: This figure-- and many others-- continues to ship due to popularity. As a result, this figure can come with any of multiple build-a-droid parts. As such, depending on which droid(s) you're looking to collect, it's in your best interests to make sure you look or ask before making the purchase. Commentary: Around 2005 Hasbro got a whiff of the kind of green they could be making from their toy Clone Trooper action figures. Three years later we're seeing the realization of "the dream," with the kind of crazy variations, repaints, armor-enhanced, and other varieties of this fan-friendly figure. From a single mold, Hasbro has so far required two flavors of vehicle drivers, this grey version, white clones, damaged clones, 501st and 212th clones, space clones, Coruscant clones, and more you're just not ready to handle yet. It's nuts, and each one is based on a fairly solid mold. This particular figure features the 14 points of articulation you've come to expect with additional movement on the wrists, allowing for superior posing with rifles or on vehicles. Unfortunately, lateral hip movement has not yet been included on any animated clones, which is something I feel is really missing when you're dealing with biker figures. The final figures have a little bit of leg warping, which is a bit of a pain. Sure, you could boil them back into place, but you shouldn't have to. If you take a plain white clone as a base, this figure adds grey stripes, a couple of dots on the chest, and the same red shoulder marking we saw on the AT-TE driver clone and the Battle of Christophsis clones. As a unique clone, this set is worth getting just for the novelty of the grey-striped clone thing. But if you think grey is too bland, well, save your money and get one of the kajillion other troopers out there. Collector's Notes: This set has been in decent circulation since it came out, and it provides a good bang for the buck. The clone figure is a repaint of a $7-$8 toy, and you get two of them. You also get two fairly sizable speederbikes. Were this an exclusive at a convention, you'd probably be paying $25 for 1 bike and 1 clone. So chew on that, or something. 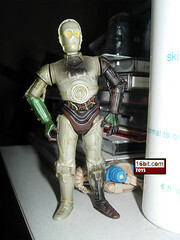 Commentary: This C-3PO became the definitive mold for Episode II versions of the character. As the very first use of that mold, it's notable not only for historical reasons, but because it has a feature later releases did away with. What do I speak of? His head. There's a magnetic plug in the top of his skull which lets you "remove" the head with the use of the included crane or the 2003 R2-D2 with rockets and magnets and whatnot. Either way, this figure was designed for play in mind. You can swap his arms with any of the removable arm Battle Droids (one was included, more came out from 2006-present) and he even has a hole for a backpack. He's pretty wonderful, plus he was painted so well that subsequent issues of this particular version of ol' goldenrod looked pretty much the same. Hasbro nailed it, with a great pose and a lot of personality shining through his muddied face. Get this one, it's definitely a great plaything and a nice collectible to boot. Collector's Notes: For whatever reason, I found tons of these on clearance for super-cheap. For $10, it was a great deal. Today it can be found for less, making it a true steal. If you're a playset fan, get this, a Geonosis Arena, the Padme with the conveyor belt, and a deluxe Super Battle Droid with the factory bit, and set yourself up a grand old time. 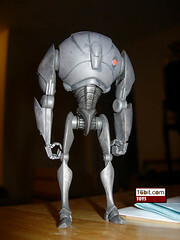 The body with a modified head and a few Battle Droid parts was sold in basic packaging on and off from 2006-2008, and we treated this as a separate release. Commentary: While the costume of this Imperial Officer doesn't match that of his packaging, it's still not a bad figure. You see, in 2001, Hasbro made an Imperial Officer and said "we're going to refresh it with two more heads!" Great, right? 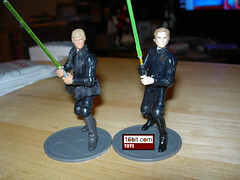 Well, the two heads weren't cycled in during Power of the Jedi, but rather shipped as very early 2003 releases instead. The body is the same, so the figure still has swivel gloves, swivel biceps, and normal hips, shoulders, waist, and neck. It's the head that's distinctive, as the brim of his hat is pulled down and the figure has blonde hair. The other two versions have darkish brown hair, so this is the one that's the easiest to distinguish-- he also has more notable facial features. Your main reason for buying this figure is to flesh out dioramas or, perhaps in the distant future, some form of playset. You see, we in the distant past year of 2009 have no playsets, so we bought these figures with the hopes one would someday come. Hopefully our patience has rewarded you in the far flung year of 2020. Commentary: After six unique buildable droids, this is the very first normal R2 unit. R2-L3 is, from all accounts (which is to say few) a background droid from Attack of the Clones and supposedly appears in one of the visual dictionaries, which really doesn't help you at all. My guess is that it's a Coruscant or Mos Espa droid and as I'm a little pressed for time as I write this I am unable to research it frame-by-frame. 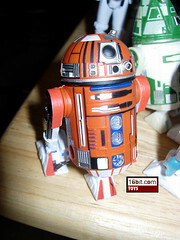 The figure is largely the same as the R4 build-a-droids except for the paint and the dome. There's quite a bit of color in the movie droid, some of which is lost in translation from movie to prototype to toy. There seems to be an entire layer of paint which was dropped, giving the figure an orangey, brown grime on top of it. The sludgy version looked extra cool, and this release is merely awesome. I love all the strange boxes and lines, there were some similar elements to be found in the original Star Wars. Heck, were he dirty, he'd probably fit right in the back of a sandcrawler. The figure has moving ankles, a removable third leg, a swiveling dome, and moving arms. Like the other droids, he has extra holes near his feet which allow you to connect additional limbs as you see fit. If you like red droids with lots of black on them, plus white feet, this is the toy for you. I wish it was out earlier it looks so gorgeous, kudos to Hasbro for identifying such a unique looking background droid which just looks freaking fantastic. It won't offer you much new that your other droids already offer, but hey, it's neat. Collector's Notes: Around the day this figure was released, there was no information to be found online (easily, at least) regarding the character's background. Parts came with Pons Limbic, Obi-Wan Kenobi, Trinto Duaba, and Wioslea. I expect this one to be tough to put together down the road. Image: In front of some vent. Commentary: In the Star Wars: Legacy storylines, the authors managed to do a really great story which was essentially "filler" with Joker Squad. These characters did make a return appearance, the survivors anyway, and one of the more memorable ones was Sgt. Harkas. He stood out because he had rank stripes, a first for Stormtroopers, and what's really neat is that the color more accurately matches the one used on Gentle Giant's Attack of the Clones clone trooper sergeants. Since Hasbro won't/can't/doesn't make those clones, this is pretty sweet. Of course, just how authentic is it given the fact that Hasbro reused the helmets and bodies of previously released Original Trilogy-era troopers? It's pretty good. I'm happy to give Hasbro a pass here because the Legacy artists are really inconsistent about how the troopers are drawn, with different helmets, armors, and styles used throughout the series. The lenses on the helmet, don't match the #0 or #0 1/2 guidebooks, but that's probably OK as we never see Harkas in his helmet anyway. Oh, and a few grey details are missing too, but that's OK as these are from a different era. I was surprised to see the final product had an all-white bucket to wear, given the clones usually had stripes of some sort on it. So really, what you have here is a standard-issue Stormtrooper body and helmet with a new head, a white holster, and a normal blaster. The main important thing about this figure is its head sculpt. He looks a lot like his appearance in the Claws of the Dragon storyline, which is to say, balding less. The figure's hair seems slightly redder than his comic counterpart, and he isn't quite as grizzled. Between the comic and the toy, I prefer how the toy looks. Because of the big hair and beard, there is one tiny problem-- the helmet is an especially tight fit. Since we never saw him wearing the helmet in the comics, it's not quite as big of a deal, but it would've been nice if it wasn't quite so snug. Still, he looks good, and in the package the set looks great. It's wonderful out of the package too, and this figure's extremely tight helmet is pretty much my only big complaint about how the final figures turned out as playthings. He's just perfect to stand around, look at people, point, and yell. He's got a good amount of personality in his face, which is important when you're dealing with a whole squad of dudes in essentially identical gear. I really wish Hasbro and/or Dark Horse had some sort of vehicle to go with these guys. They seem like they'd be at home in a shuttle or something. Collector's Notes: Full disclosure: we asked for this from Hasbro as part of my day job at, you guessed it, Entertainment Earth. As such I'm pretty pleased with them. These are the reasons I get up in the morning. It's brand new-- I'm told mine was the first order processed, basically-- so those who pre-ordered should be getting these any day now. Commentary: The speed of this figure's release was more than a little surprise. 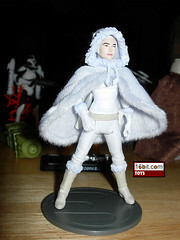 Padmé Amidala in her Ilum outfit was first released in 2007 as a fairly stiff, underarticulated action figure with a strange pose-- and this 2008 figure was a kajillion times better. A new sculpt, she's now a fully articulated ultra-modern space vixen. Her outfit has a cloth cape, but a plastic hood better frames her face and stays where it's supposed to. Her blaster fits neatly into her holster, and she can sit or stand or whatever. 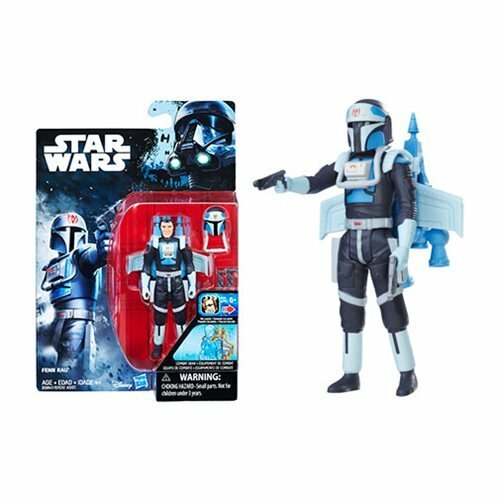 If you liked those first Clone Wars cartoons, this figure is a can't-miss release, but their are downers. (See below.) As a stand-alone release she's great, but no other Ilum-specific figures are really on the market outside a Battle Pack which includes yet another version of her in this very costume. Hasbro did us right with this second attempt, but do you really need two? Collector's Notes: To date this mold has never been reissued or resculpted. This is the only release. Another sculpt of Padmé was an exclusive the previous year and included two Chameleon Droids which, to date, remain as exclusives to Target. So if you want everything Ilum, you're going to have to own at least two different versions of the same snow Padmé from about 18 months apart. Nice one, Hasbro. Commentary: Over the years figures from Star Wars get more and more specific. It isn't just Princess Leia, but it's Leia from the opening scenes in the movie during the few frames where she had a hood over her head. Since it was released in 2000, this was one of those figures that was still designed with the toy-ness as a priority. 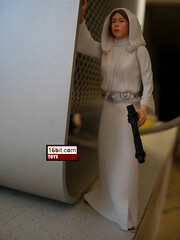 She's taller than more recent Leia figures, but she can sit-- and Leia figures typically can't. Hasbro's decision to give her a cloth dress from the waist on down helped this one a lot, giving it a distinctive appearance and allowing her to pilot any ship you so choose. This Leia is on par with most recent releases, as the likeness is pretty good, the outfit is fairly crisp, and there's a decent amount of articulation. She can even put her hand on R2-D2 to "program" him for Obi-Wan Kenobi. Fans liked this mold so much that they were understandably upset when it wasn't used as the basis of the Holographic Princess Leia figure in 2005. It's a winner, and one of Hasbro's finer overall works despite having only 6 joints. If you don't have a good Leia from the original film, consider this one. I don't think you'll be disappointed. Collector's Notes: To date this mold has never been reissued or resculpted. This is the only release. Commentary: When I first saw this Felucian Rider I wasn't sure what to make of it. I'm still not. It looks like some undersea creature wearing a tiki mask of some sort. Usually when I get an alien toy I can look at its head and go "that's an eye, that's a mouth," or something like that with whatever elements are present. I'm not sure what the Hell I'm looking at here. Are french fries growing out of his head? Are those goggles? Is that a mustache? I do not know. I can tell that the figure has armor, as several flexible pieces are around what is undoubtedly a waist. There are limbs which may be arms, but they've got extra arms on them. Like, there's suction-cuppy things where the normal hands are, but out of the forearms are additional smaller arms. I think. What are these? 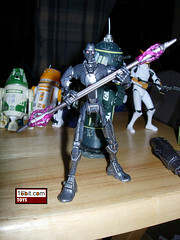 Collector's Notes: To date this is the only Felucian action figure from Hasbro. So if you want it, well, this is it.